Thirteen years ago, when I was working as an exotic animal veterinary technician, I bought my friend a gift—a juniper bonsai—that would set me on a course that I never could have imagined. I already had a yard full of tropical plants, succulents, and orchids, but once I added my first bonsai, I knew something had changed. It was the beginning of a journey that took me from Gainesville, Florida, to Washington, D.C., to Japan and finally here to the Chicago Botanic Garden, where I am the curator in charge of the Bonsai Collection, which is known as one of the best of its kind in the world. 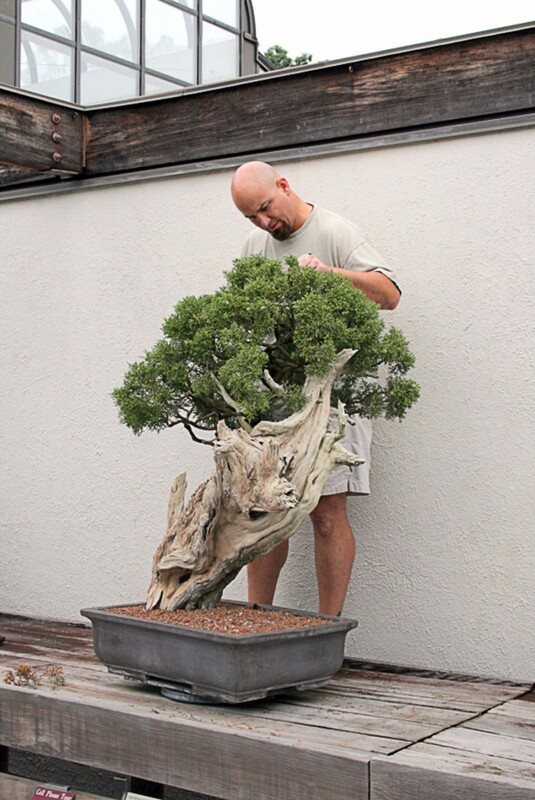 Tending this large bonsai is a delicate task. Shortly after I purchased my first tree, I started learning about bonsai and joined a prominent bonsai club in Gainesville. In 2006, Gainesville (home of the Gators) hosted the State Bonsai Convention. That weekend was an eye-opening experience for me, as I got to learn from and assist international bonsai artists like Jim Smith, Colin Lewis, and others. That weekend convention was very influential and would fuel my desire to continue learning. Less than a year after that convention, I had an opportunity to move to Baltimore, Maryland, and work at the National Aquarium. I quickly joined the Baltimore Bonsai Society and continued learning. Feeling more and more drawn to a career in horticulture, I made the move from veterinary technician to horticulturist of the Rainforest Exhibit at the National Aquarium. This opportunity made me think that I actually could have a career working with bonsai. Then, during a Baltimore Bonsai Club event at the National Arboretum’s Bonsai and Penjing Museum in Washington, D.C., I had a chance meeting with the curator Jack Sustic. I introduced myself by saying, “Hi, I’m Chris Baker. I have aspirations of being a bonsai curator some day, and I would like to volunteer here at the collection.” That sentence would forever alter my path. My time as a volunteer and then intern at the National Arboretum was inspirational and educational, and ultimately would lead me to Japan. Jack Sustic would become a mentor and friend; he introduced me to Torhu Suzuki at the Daijuen Bonsai Nursery in Okazaki, Japan, where he had spent some time. Suzuki, or “Oyakata” (an honorific reserved for a person of high authority) as we would call him, was a third-generation bonsai master and prominent figure in Japanese bonsai culture. In 2012, I spent six months as an apprentice at Daijuen. In that time I learned so many lessons and skills that I use every day. It also gave me an entirely different perspective on how the practice of bonsai has evolved in Japan for centuries. In April 2014, I started as the curator of bonsai at the Chicago Botanic Garden. Having the opportunity to be the first full-time curator here at a collection of this caliber is a dream job, which comes with a lot of expectations and responsibility. During the display season (April to November), horticulturists Joe Olsen and Gabe Hutchinson provided great support in keeping the trees watered and benches looking great for our visitors. The remaining trees are kept on the south end of the Garden, in the production area. Brian Clark, manager of plant production, and his team help care for the trees on my days off. Last but not least, the support of my 12 volunteers is essential. They are a great team of dedicated people who each brings something different to the Collection. Volunteer Eileen Michal working on the Collection with me. I’m often asked what has drawn me to bonsai, and why would I pursue a career in it, with only ten or so full-time curator jobs in the entire country? For me, bonsai starts with an appreciation of nature over all things. An ancient tree has the power to move people and evoke emotion. It’s what inspired the Chinese centuries ago to take something of beauty they saw in nature and grow it in a container. Creating bonsai takes the eye of an artist, the horticultural knowledge of a botanist, and the hands of a mechanic. I have been painting and creating art with many mediums for years. I often draw my trees prior to styling them. It allows me to see different style ideas before I even touch a single branch. I love the horticultural aspect of bonsai, from soil science, to fertilizing, to advanced techniques of grafting and air layering. To me, the mechanical aspect is fun as well. I enjoy making large bends in branches using rebar and guy wires on developmental trees, as well as doing the fine detail work for a show-quality tree. A bonsai is never finished, and the skills and knowledge of a true bonsai expert take a lifetime of study to master and fully understand all it has to offer. Bonsai has taught me many things, introduced me to wonderful people, and taken me to places I never thought I’d see…At this point in my life, it just seems silly for me to do anything else. Know someone else curious about the Garden’s Bonsai Collection? 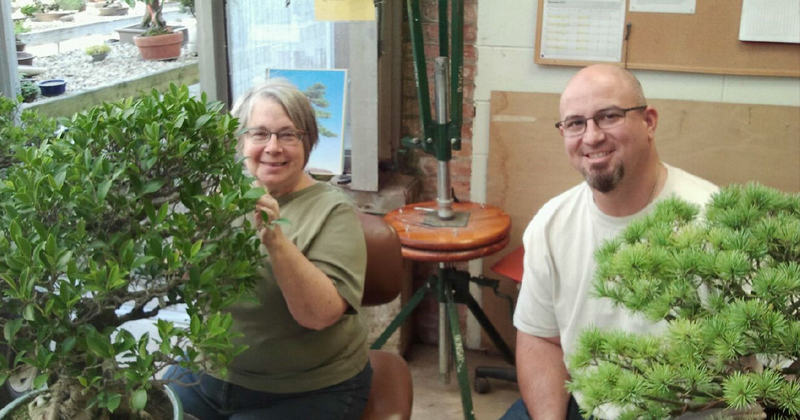 Bonsai: A Patient Art makes a great gift.